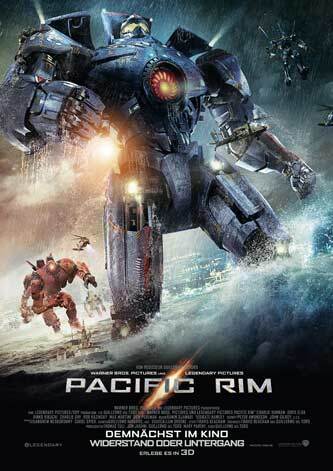 With huge human-controlled robots humanity fights destructive alien monster from the sea. „Iron Man“ meets „Godzilla“ in this somewhat overzealous and shallow action drama by Guillermo del Toro („Pan's Labyrinth„). 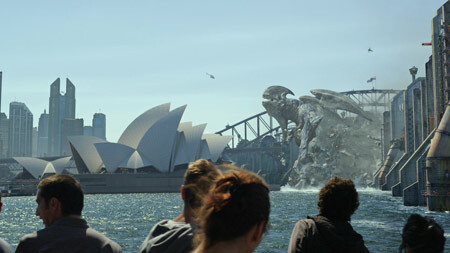 Repeatedly gigantic alien monsters called kaijus emerge from the sea and cover the world in great destruction. That’s why the overburdened governments join together to initiate a successful weaponry project: for the Jaeger project huge robots are built with extensive weapons systems. 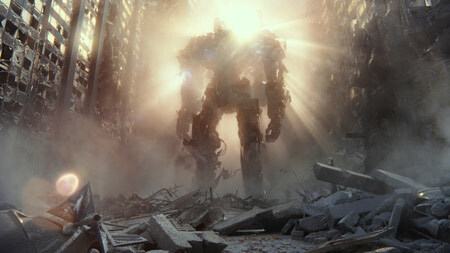 These giant mechas are controlled by two battle-hardened pilots, whose brains are connected by a neuro bridge. After his brother Yancy (Diego Klattenhoff) was killed in battle while their consciousness was coupled, Raleigh Beckett (Charlie Hunnam) gives up this job and works with the new program stop the monsters: construction of worldwide coastal walls. Because only one project can be financed by the governments, the Jaeger project gets shut down. 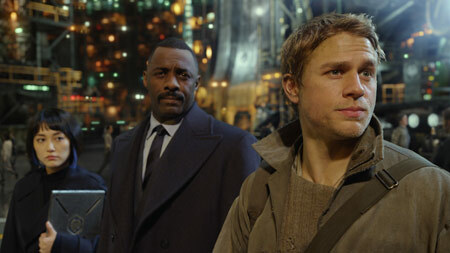 However, when one of the quickly learning aliens breaks through a wall in Sydney, officer Stacker Pentecost (Idris Elba) musters up all operational, albeit partly outdated Jaegers and pilots. While researcher Dr. Newton Geizler (Charlie Day) is looking for another solution, Pentecost plans a bold attack to close the portal in the Pacific, through which the aliens come forth from another dimension in ever shorter intervals. Because the coupling of the pilots’ brains requires not only trust, but also compatibility, Raleigh needs to find a suitable partner. Although Mako Mori (Rinko Kikuchi) is willing and able, Pentecost will not let them at first. Finally he grants permission, but Mako gets caught in the pitfalls of consciousness coupling. However, as for the first time two monsters come through the portal at the same time, Mako and Raleigh must go into battle perforce. 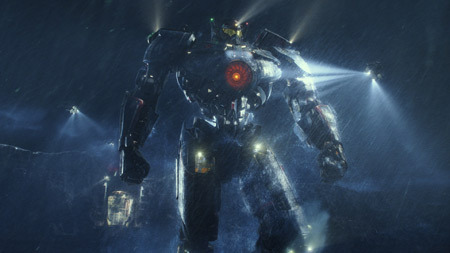 Co-writer, producer and director Guillermo del Toro ("Pan's Labyrinth", "Hellboy", "Blade II") wanted "Pacific Rim" to be a lighter film as opposed to supposedly more cynical, darker summer blockbusters, and an inspiration to younger audiences to watch more kaiju/monster or mecha/robot movies. It's almost extraordinary that such an expensive project was realized, which is based on an original idea and not on well-established franchise. 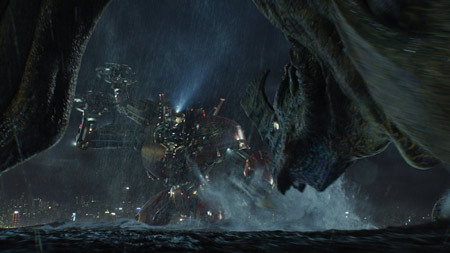 Nevertheless, the film looks like a hybrid of an unironic "Iron Man" and livelier "Godzilla" and thus somehow familiar. 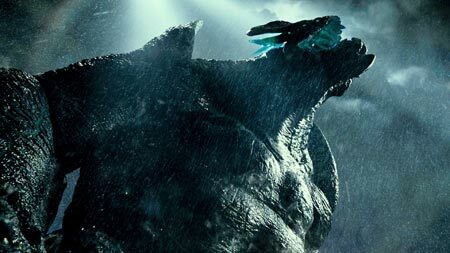 The world's most famous kaiju is Godzilla and just as in Roland Emmerich's Hollywood version fights take place mostly at night, in rain, around falling debris or in the deep of the sea. In addition, the monsters are much more agile, the machine-beast-fights often engulfed in direct contact. Thus fighting scenes are a bit blurred. A few times however, the use of 3D technology is pleasing to the eye, but the film does not provide more than solid action entertainment. The production is quite targeted on the Asian market, by the setting or casting Japanese Oscar-nominee Rinko Kikuch ("Babel") for one of the main characters. Even the design is partly inspired by Asian mangas, e.g. some might be reminded of "Neon Genesis Evangelion". 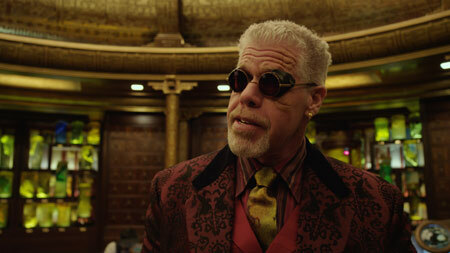 Yet, the production design moves unfortunately sways between cool and ridiculous. While some designs look really great, there are other details which are inconsistent. For example some buildings and signs look worn, as if they were several decades old, but that hardly fits into the plot period of a few years in which the Jaeger project or the walls are built. And that the kaijus glow blue from the inside or the cartoonish look of the character Hannibal Chau (played by "Hellboy" Ron Perlman) is somewhat strange. This sci-fi action movie actually isn’t as light as del Toro intended because of a lot of drama with personal conflicts such as Makos self-doubt, the malicious rejection of Raleigh by other pilots and dark images—unlike "Iron Man 3" earlier this year has set an example for. With Charlie Day ("Horrible Bosses", "Going the Distance") there is a quirky character who is supposed to provide some comic relief, but even that only works partially. And only once there is the right music and look to create a short moment of rock-star-like battle joy. 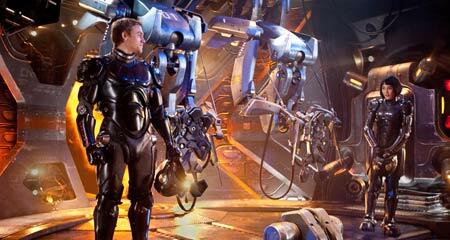 Otherwise, "Pacific Rim" is quite heavy. Unfortunately this heaviness is not coupled with depth. The psychological conflicts are mere blueprints, the characters only meet the requirements of the story. What kind of impact the alien invasion really has on the population, is strongly suppressed by the focus on a few soldiers, limiting the threat to destruction of city structures. This superficiality of destruction again reminds of Emmerich's "Godzilla". Surprises and twists are overrated anyway, so viewers have to switch to autopilot and cruise through the problems and battles until the pre-programmed end.